Recently, I stumbled across a section of WordPress called The Daily Post. It’s a place where bloggers can get brilliant ideas and share their responses to a variety of creative prompts. I remember hoping for a similar experience with the Eat.Live.Be. community and it made me nostalgic. For a brief instant, I wanted to “sign up” to post every day. I imagined creative poems, short stories or even snapping pictures that would inspire, be commented upon or even *gasp* featured. 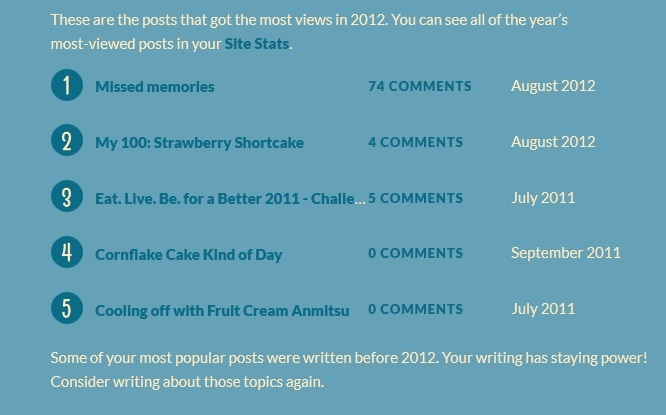 Like other bloggers through WordPress, I was greeted come New Year’s Day with my “year in review” blog stats in my inbox. It told me what people loved, where they came from, and how I was doing with my output. I will admit to grinning like a loon when someone likes a post, especially if I think it’s no good, but I don’t usually sweat the numbers. Even with my overly-optimistic ego, I am still rather amazed that even one person thinks my blog is worth reading. What that cheery little email told me, however, surprised me . . .
. . . and depressed me – not because of what people liked, but of what the analysis was telling me. Outside of that first post, the rest on that list are food related. Apparently, according to the advice, if I want to be “popular” I need to “consider” writing about food. I know that in my blogger’s heart, I don’t want to turn iscribblings into a food blog. There are way too many more accomplished food bloggers out there that my own contribution would be an oily drop in an ocean of greatness. On the other hand, though, my ever present junior-high ego would love the popularity. In a lot of ways, having a “focus” would mean security – I’d know what to write and how to write it. Writing about food comes easily for me and I love to write about recipes. The blog would have a theme and something to ground it. And then I remembered a short conversation (more like a comm-versation) I had with the lovely Bex from The Savvy Senorita on starting a blog and resisting being pegged. Being grounded isn’t where I’m at right now. Nor was it when I started this blog. I wanted to share ideas, share stories, share recipes – basically share my life as it is and how I saw it. It would be an account of my self at any given time – a bit thoughtful, a bit happy, a bit scribbly but all me. I love thinking about what I’ll write about for my weekly posts. It gives me the opportunity to dwell on life and at the same time challenges me to convey that life to those who know little about me. This sparks my interest and keeps me blogging. Categories: Life, Musings | Tags: blogs, Musings, writing | Permalink.